The Narcissistic Solution – The patient creates and projects an omnipotent, omniscient, and omnipresent False Self that largely replaces and represses the discredited and dilapidated True Self. He uses the False Self to garner narcissistic supply (attention, both positive and negative) and thus support his inflated fantasies. Both the Narcissistic and the Schizotypal Personality Disorders belong here because both involve grandiose, fantastic, and magical thinking. When the narcissistic solution fails, we have the Borderline Personality Disorder (BPD). The Borderline patient's awareness that the solution that she had opted for is "not working" generates in her an overwhelming separation anxiety (fear of abandonment), an identity disturbance, affective and emotional lability, suicidal ideation, and suicidal action, chronic feelings of emptiness, rage attacks, and transient (stress related) paranoid ideation. The Appropriation Solution – This solution involves the appropriation of someone else's imagined (and, therefore, confabulated and false) self instead of one's dysfunctional True Self. Such people live vicariously, through others, and by proxy. Consider the Histrionic Personality Disorder. Histrionics sexualize and objectify others and then internalize (introject) them. Lacking an inner reality (True Self) they over-rate and over-emphasise their bodies. Histrionics and other "appropriators" misjudge the intimacy of their faux relationships and the degree of commitment involved. They are easily suggestible and their senses of self and self-worth shift and fluctuate with input from the outside (narcissistic supply). Another example of this type of solution is the Dependent Personality Disorder (codependents). Manipulative mothers who "sacrifice" their lives for their children, "drama queens", and people with factitious disorders (for instance, Munchausen Syndrome) also belong to this category. The Schizoid Solution – Sometimes the emergence of the False Self is stunted or disrupted. The True Self remain immature and dysfunctional but it is not replaced by a functioning narcissistic defense mechanism. Such patients are mental zombies, trapped forever in the no-man's land between infancy and adulthood. They lack empathy, their psychosexual life is impoverished, they prefer to avoid contact with others, and withdraw from the world. The Schizotypal Personality Disorder is a mixture of the narcissistic and the schizoid solutions. The Avoidant Personality Disorder is a close kin. "The Aggressive Destructive Solution – These people suffer from hypochondriasis, depression, suicidal ideation, dysphoria, anhedonia, compulsions and obsessions and other expressions of internalized and transformed aggression directed at a self which is perceived to be inadequate, guilty, disappointing and worthy of nothing but elimination. 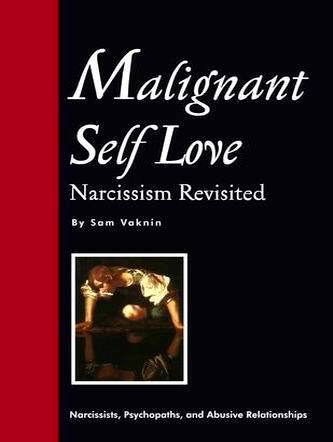 Many of the narcissistic elements are present in an exaggerated form. Lack of empathy becomes reckless disregard for others, irritability, deceitfulness and criminal violence. Undulating self-esteem is transformed into impulsiveness and failure to plan ahead. The Antisocial Personality Disorder is a prime example of this solution, whose essence is: the total control of a False Self, without the mitigating presence of a shred of True Self.